One of those memorable dishes that combines flavours and textures to capture the Sicilian sun and bring it to a grey and wet Dublin summer evening; magic. Thinly slice the Aubergine, sprinkle with salt and leave to drain in a colander for at least 2 hours. Squeeze lightly to get rid of excess liquid. Preheat oven to 180C / 350F / Gas 4. Grease a round cake tin with the unsalted butter; we used one that was 23cm wide and 3.5cm deep. put in 2 tablespoons of breadcrumbs and shake and turn the dish so that that they stick to the butter and line the dish. Heat about 6mm of olive oil in a deep frying pan and sauté the aubergine slices in batches until lightly coloured. Lift out and drain on kitchen paper. 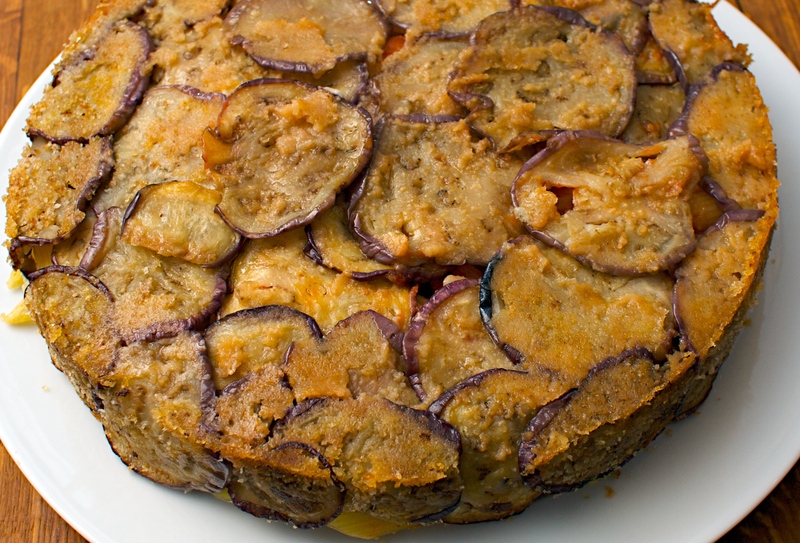 Using about three quarters of the aubergine cover the base and sides of the breadcrumbed tin. Make sure that you overlap the slices so that there are no gaps. Heat a tablespoon of olive oil in a pan and cook the onion and garlic over a medium heat until soft, but not coloured. Add the tin of tomatoes and season with salt. Cover with a lid and simmer over a low heat for 10 minutes. While this is cooking bring a pan of water to the boil, salt well and cook the pasta for 3 minutes less than the packet instructions, so that it is still al dente. Reserve some cooking water and then drain the pasta. 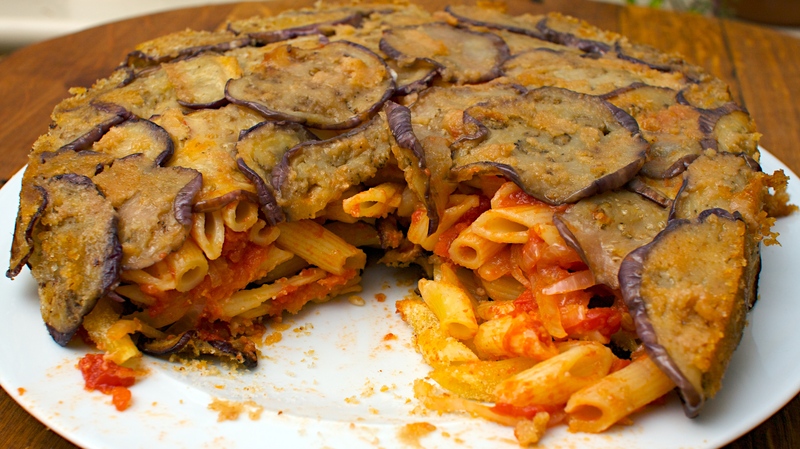 Spoon a layer of the pasta into the aubergine lined tin followed by tomato sauce, a layer of the aubergine and a layer of grated cheese. Repeat with the remaining pasta, tomato sauce, and a final layer of aubergine. Finish with the remaining breadcrumbs to form a coating on the top. Bake in the preheated oven for about 25 minutes and until golden. Let stand for about 10 minutes. This will allow the dish to firm up. Put a plate over the top of the tin and holding both the plate and dish firmly, turn both over together so that the Timballo turns out onto the plate. Serve in wedges. Serve with: a southern Italian red like Nero d’Avola or Negroamaro, both of which have a satisfying earthiness but aren’t too heavy for the flavours in this dish. NB. if you’d like to make your own breadcrumbs, which is both easy and satisfying, then remove the crusts from stale bread, slice and put it on a baking tray in an oven at 80C for an hour to dry out. Either grate and sieve the dried bread (which gives a more random and authentic look) or blitz in a blender.